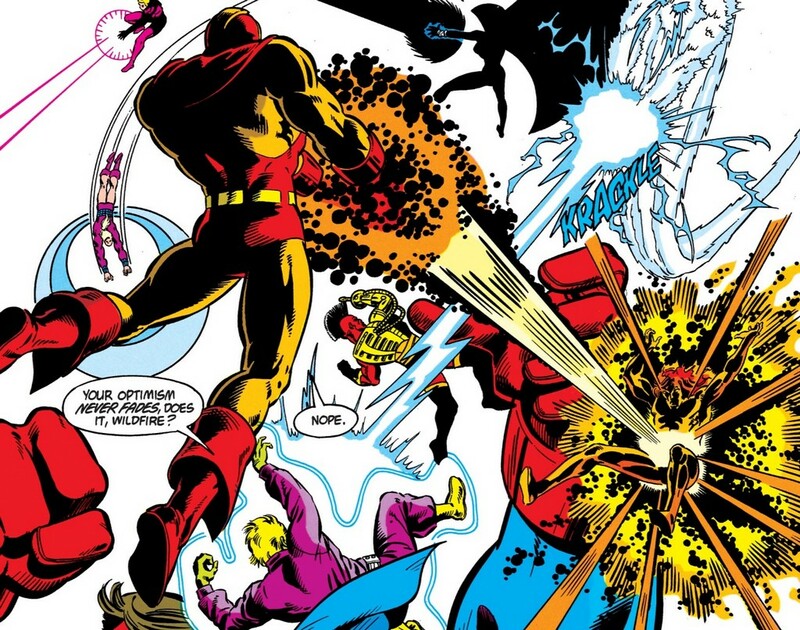 The Legion of Super-Heroes was the first modern comic book franchise. 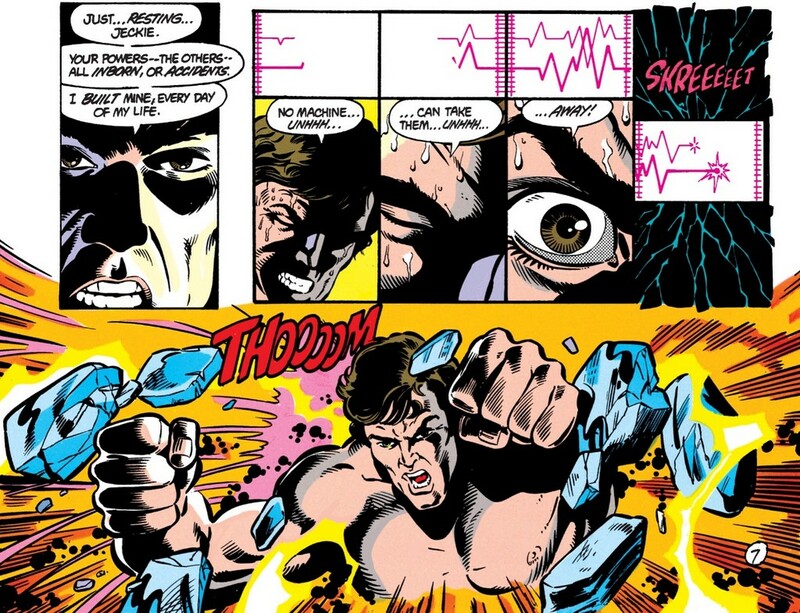 It was the one of the first series to really embrace the soap opera capabilities of comic book storytelling. There was a time, long ago, when it was one of DC’s most popular books. 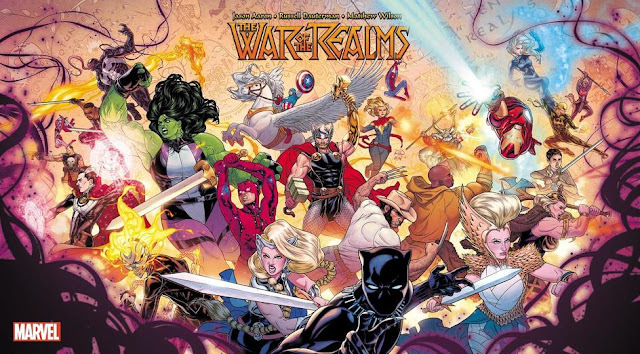 In the years since, they’ve faded into the background, to the point where they go long periods without any new comic on the stands. So today, we’re going to jump in the wayback machine, and look at a Legion of Super-Heroes story from when they were arguably at their peak. 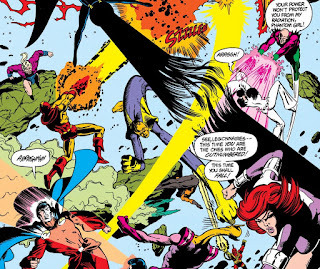 The Legion was so popular and successful, that when publishers were experimenting with the new ‘Direct Market’ (selling straight to local comic shops) DC picked their top two books, The Legion of Super-Heroes and The New Teen Titans. These comics were printed on better paper, called Baxter paper, and thus this era of the franchise became known as the Baxter Legion. Along with the better paper, forgoing the newsstand allowed the stories to also have a slightly edgier "more mature" take, a more violent take. So, that is where we begin, with Legion of Super-Heroes (volume 3) #1. 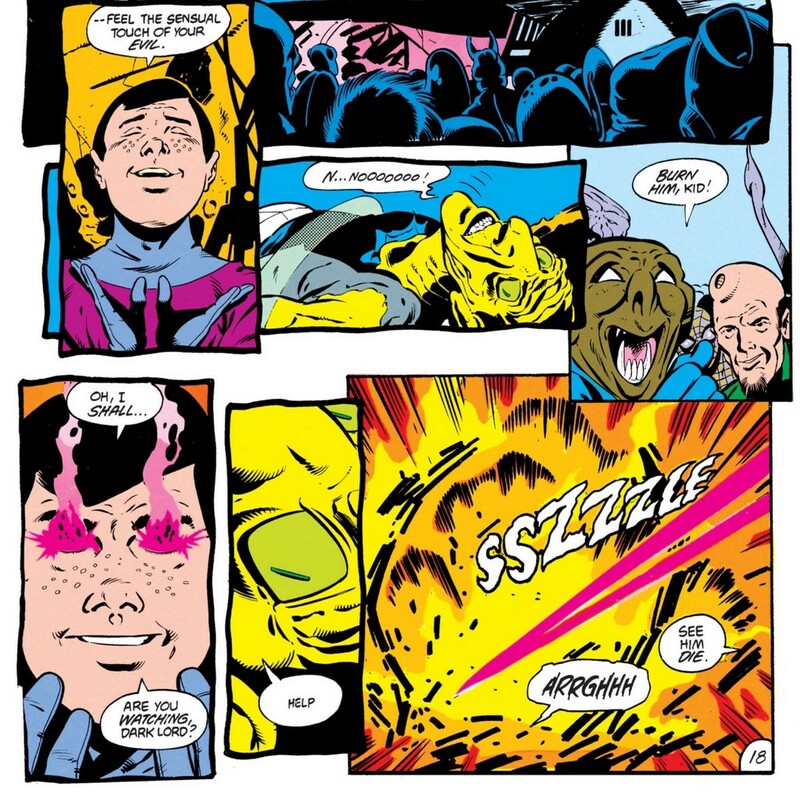 The first two issues were written by Paul Levitz, penciled by Keith Giffen, and co-plotted by both. Steve Lightle took over penciling on chapter three, Giffen remained as co-plotter and consulting artist. Larry Mahlstedt inked them all. The story begins ominously enough with Lightning Lord, older brother of Lighting Lad and Light Lass, promising to kill his younger brother. While on vacation, Dream Girl is still shaken by a troubling prophetic dream, in which a Legionnaire is going to die. 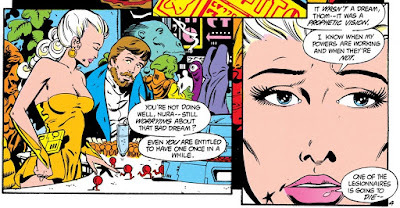 It’s at that moment that Legion villain Micro Lad picks the single worst casino to try and rob, as he was not expecting Dream Girl and Star Boy to be on site. On the planet Daxam, Mon-El and friends are surveying a landscape restoration project, in an attempt to undue the recent damage Darkseid inflicted upon the world (in the legendary The Great Darkness Saga). Their work is interrupted by a notification that a Daxamite is destroying facilities and freeing prisoners on the prison planet of Takron-Galtos. 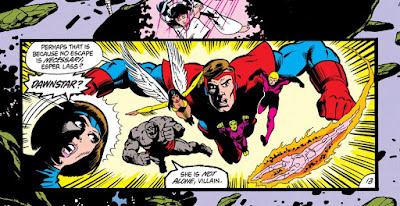 Mon-El, Shadow Lass, Ultra Boy, Timber Wolf, and Chameleon speed off to intervene. Micro Lad attempted to shrink down to escape, but is stopped by Shrinking Violet, who proceeds to beat the pulp out of him. Before she can finish the job, a strange portal appears and whisks Micro Lad away. On her home planet of Winath, the retired Light Lass is enjoying life harvesting giant mushrooms (as well as a lesbian romance, it's unclear). 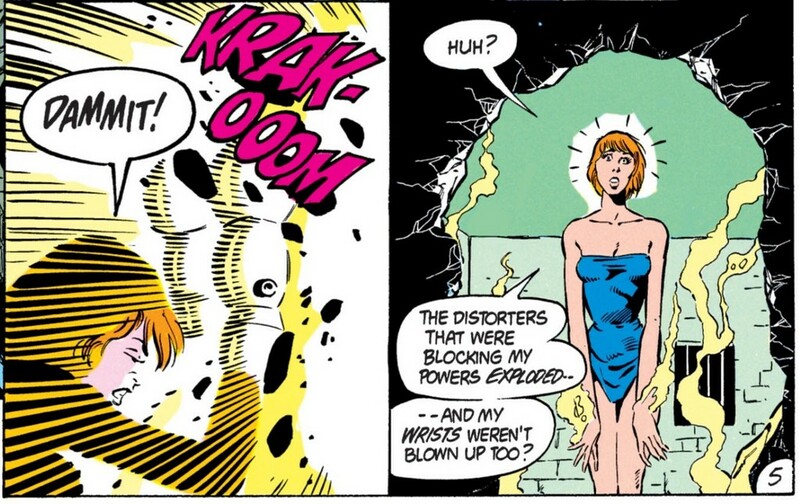 Her retirement is rudely interrupted when she’s attacked and kidnapped through one of those same portals. The Legionnaires arrive on Takron-Galtos to find a young Daxamite, still every much enthralled to the dark lord Darkseid. 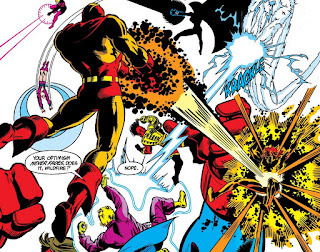 Here he is incinerating a non-believer with his heat vision. Mon-El and the others are not very happy about this, but before he can be recaptured, the Daxamite boy disappears into another one of those portals. The captive Light Lass receives a visit from her older brother, who definitely seems far more crazed and far more dangerous than he had ever been before. The newly formed Legion of Super-Villains is executing the first phase of their plan, attacking a fusion powerspheres manufacturing planet, when they are interrupted by Wildfire and Dawnstar (probably my favorite couple in all of comics). 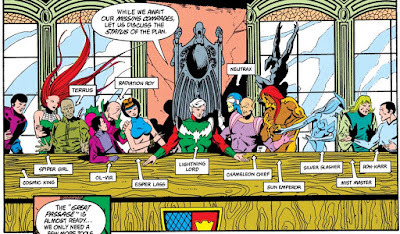 Legion headquarters gets the news, and Element Lad prepares to organize a counter-offense. Wildfire’s containment suit is predictably destroyed, leaving Dawnstar on her own against three villains. She’s seriously injured before Mon-El and Ultra Boy arrive as backup. 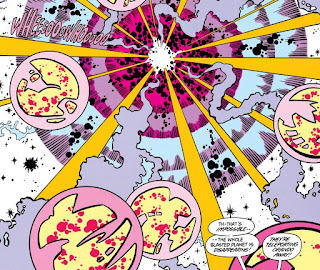 The villains escape into another one of their portals with the powerspheres. 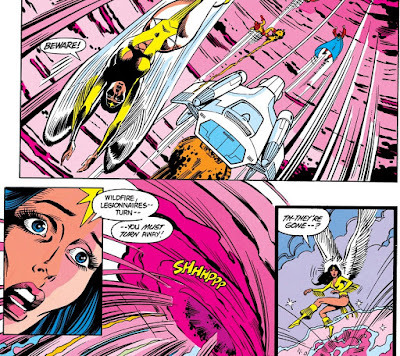 Dawnstar and Wildfire get patched up while Cosmic Boy updates the retired, and pregnant, Lightning Lad and Saturn Girl. 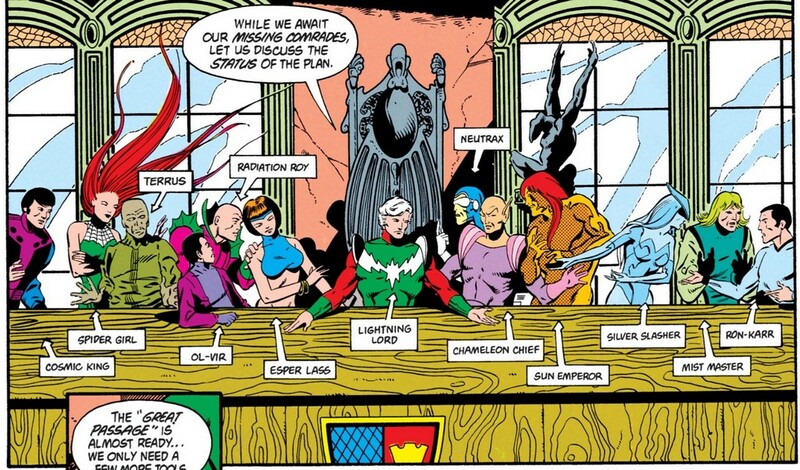 Elsewhere, Lightning Lord calls to order a meeting of this new Legion of Super-Villains. 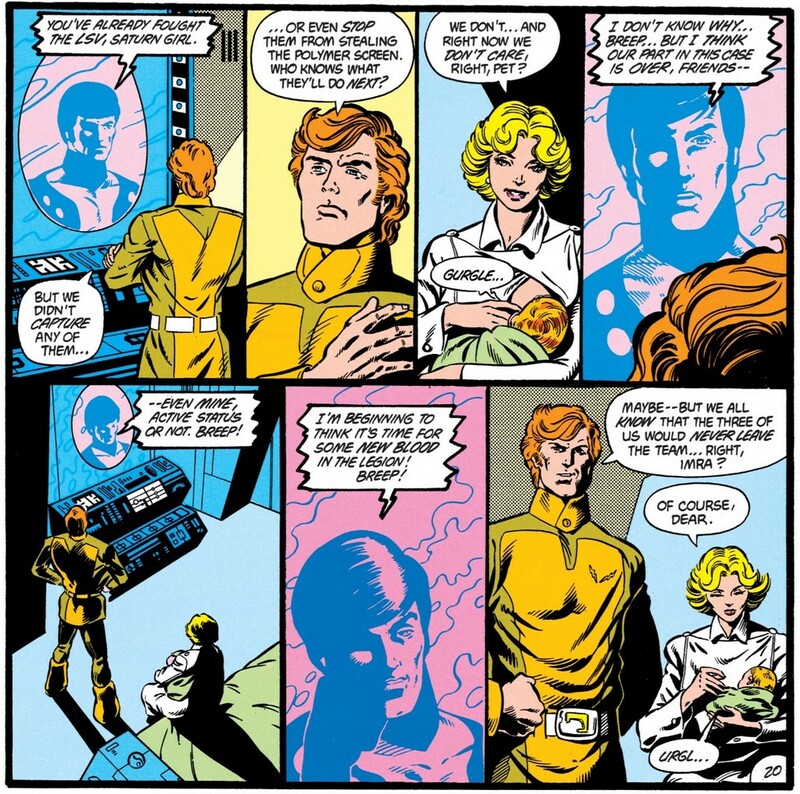 Back at Legion headquarters, Element Lad has called in every off-duty leaguer he can, but they’re still short-manned. Next, the LSV are attacking the polymer screen that surrounds the Earth, which serves various environmental purposes. 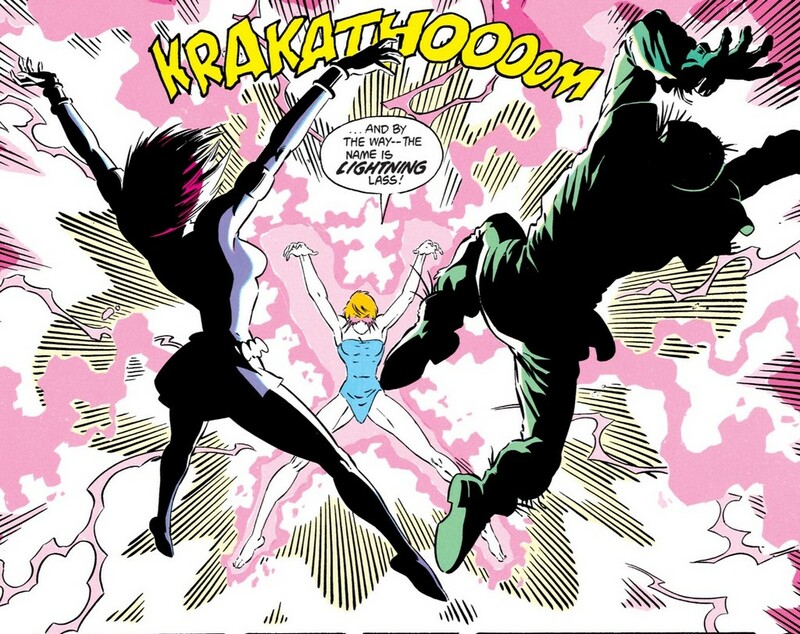 Element Lad, Lighting Lad, and Saturn Girl arrive to fight them off, but the villains escape into another portal with the polymer screen. 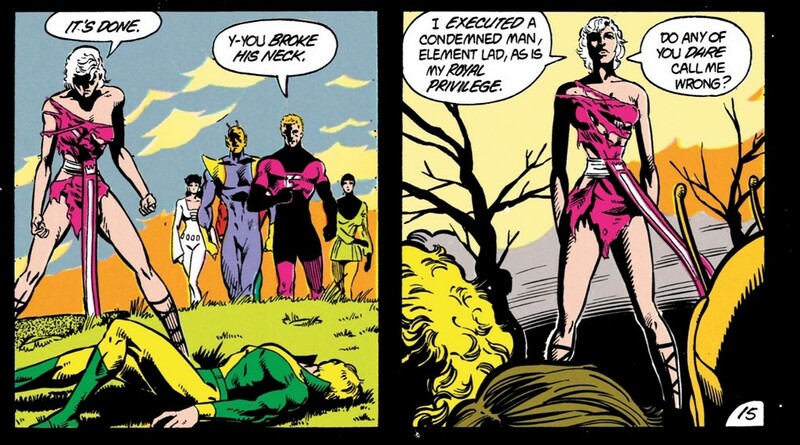 As a result of the action, Saturn Girl goes into labor. On Orando, Karate Kid and Queen Projectra are ambushed on their return home. 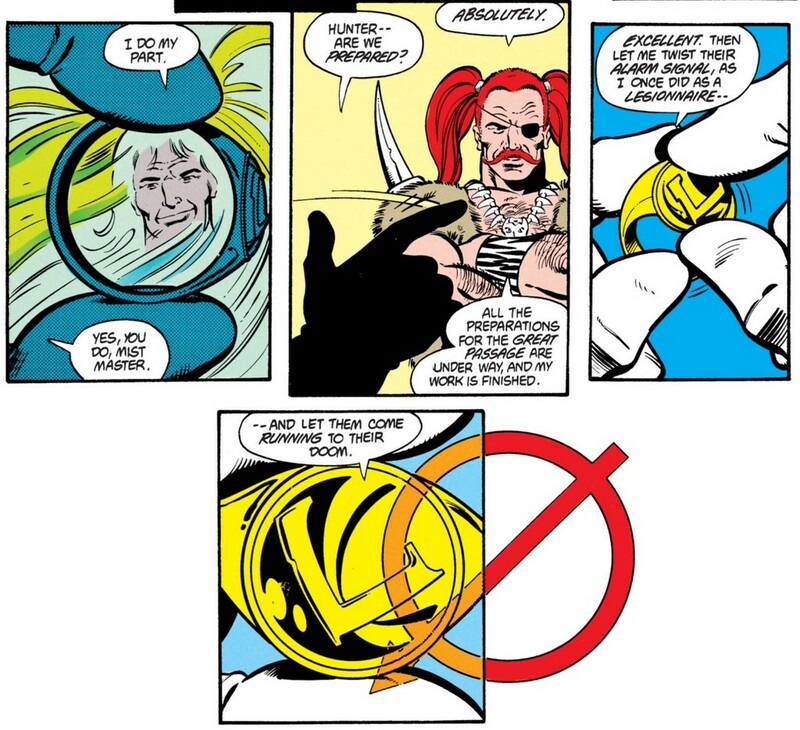 Mist Master and Hunter use Karate Kid’s Legion ring to send out a distress signal to the rest of the league. The Legion of Super-Villains have set a trap for them. 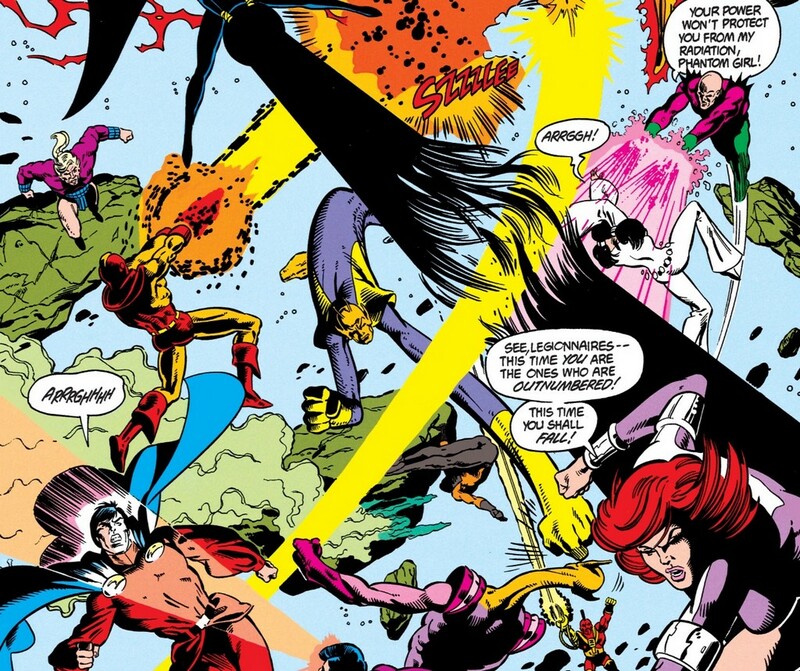 Already stretched thin, the Legion of Super-Heroes arrive on Orando in full force. 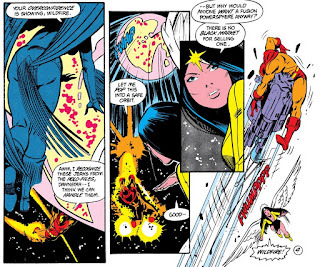 Elsewhere, Dawnstar can only watch as Mon-El, Ultra Boy, and Wilfire disappear into another strange portal. 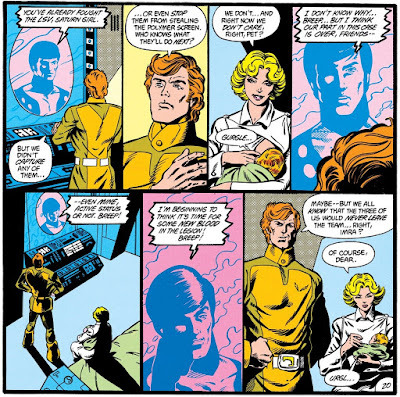 Back at Legion headquarters, only Cosmic Boy and Invisible Kid remain after the rest of the team leaves for Orando. Cosmic Boy gets a much needed call for support from the Legion of Substitute Heroes. On Orando, Light Lass can only look on from her cell at Karate Kid and Projectra, who both appear to be in bad shape. Lightning Lord arrives with one last plea to his sister to join him. 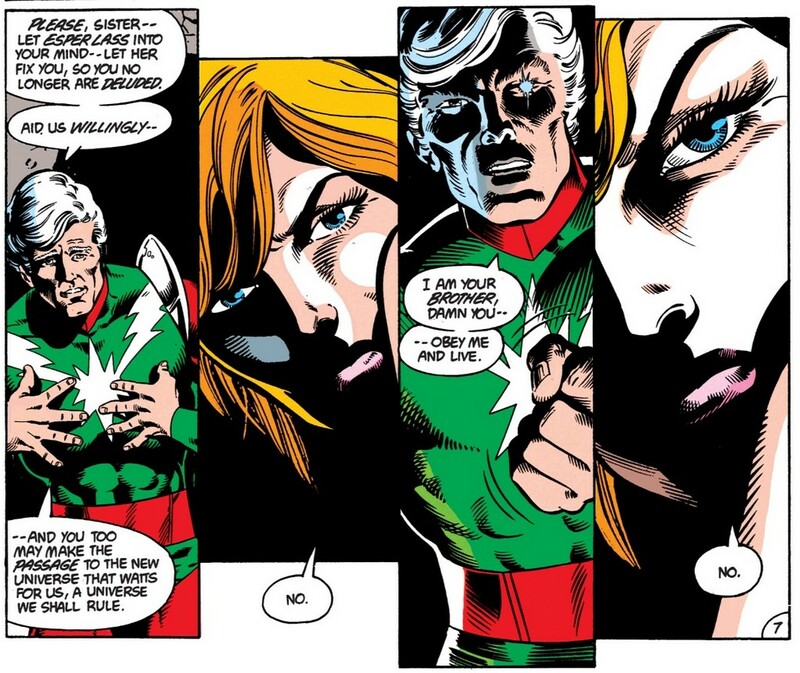 Light Lass refuses, and so he brutally shocks her with his bioelectric powers. Dream Girl wakes up in a crash after their ship was attacked on approach to Orando, and is shocked to see the castle from her prophetic dream. In Orando space, the Legionnaires are outnumbered and fighting for their lives against the LSV. It’s not going great, but thankfully reinforcements from Earth have arrived. While the battle continues, another group of villains finishes installing the polymer screen and power spheres around Orando. Planetside, the Legion of Super-Heroes begin to turn the tide of the battle. Using the power spheres as a boost to his natural abilities, Zymyr space warps all of the LSV members out of the battle, along with a few heroes. Back on Earth, Saturn Girl and baby are recovering nicely. 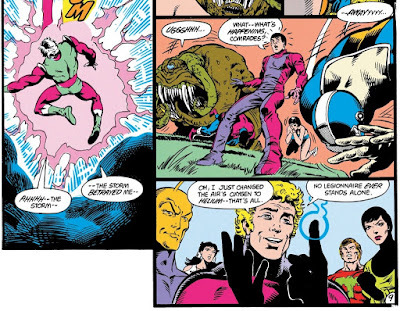 Cosmic Boy checks in on his two oldest friends, suggesting that maybe the Legion needs some new blood. 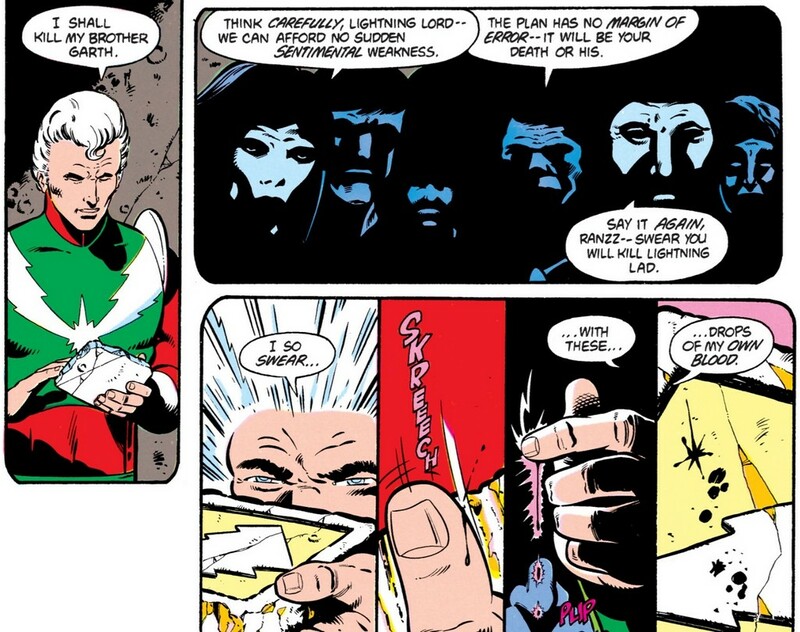 Orando, the Legion is confused and bickering after the villains disappear with some of their friends. Their confusion only multiplies as they watch all of Orando disappear into another space warp. Somewhere beyond the known universe, Nemesis Kid celebrates his victory. The next phase in the evil plan of the Legion of Super-Villains has begun. 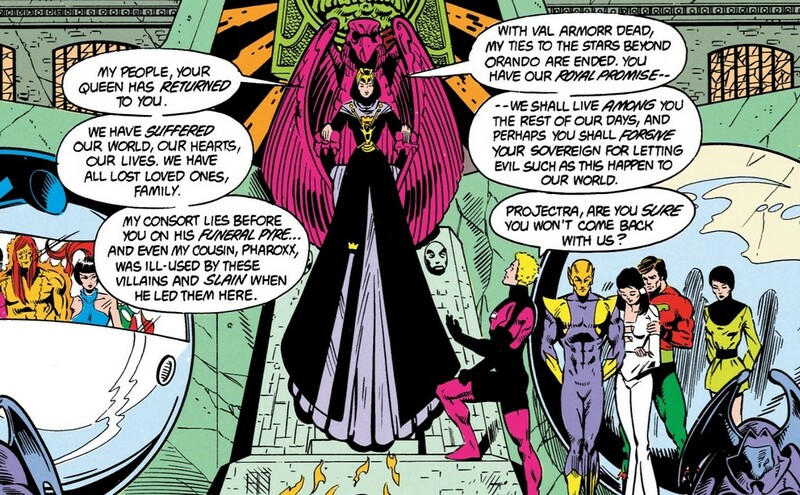 Nemesis Kid presides over his Legion of Super-Villains, many of whom were eager to continue fighting instead of “running away.” Tyr in particular, is intent on challenging his authority. A few of the others squash Tyr’s attempted disruption, and remind them all that they need to continue working together this time, if they’re finally to defeat the Legion. Back in former Orando space, the Legion try to piece together what happened. Brainiac 5 correctly surmises that since Dawnstar can no longer track their missing friends, they may have been taken into another dimension or plane of existence. In her cell, Light Lass is shocked when her bonds mysteriously explode after she slams them against the wall in frustration. 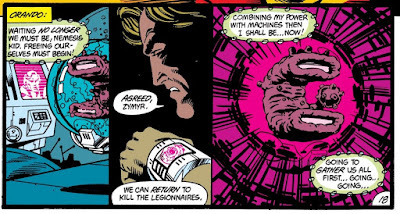 She finds the recently captured Legionnaires in bonds next to Karate Kid and Projectra. Not wanting to alert the LSV, she leaves to try and find a way to contact the LSH. Karate Kid initially agrees, but realizes after she’s gone that their bonds must be draining their willpower. Defiantly, he fights back against the machine, breaking himself free. Light Lass was able to stow away on a craft, but soon finds out its full of villains on their way back to Orando to kill the Legion. Before they can leave, she shorts out the controls knocking out three of her opponents, and stands alone against the remaining two. Little do they know her original lightning powers have returned. 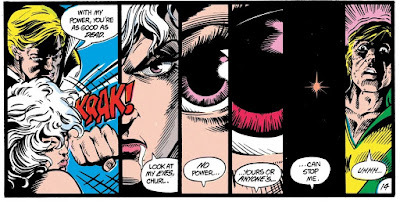 Dream Girl contacts Cosmic Boy at Legion headquarters, worried that he is an easy target. 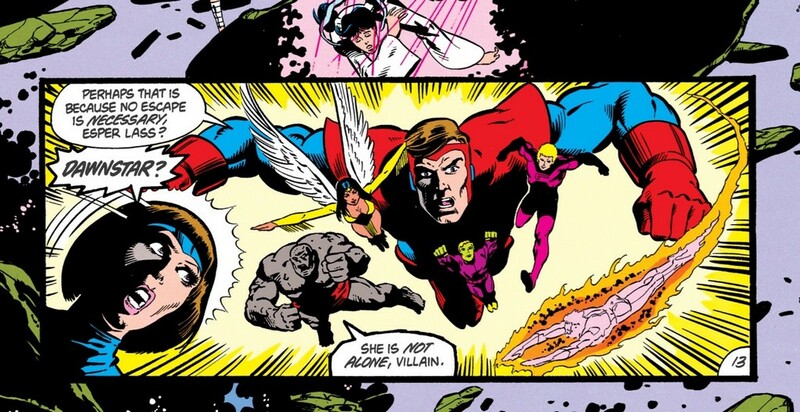 Cosmic Boy eases her fears, having called in the Substitute Heroes as backup. 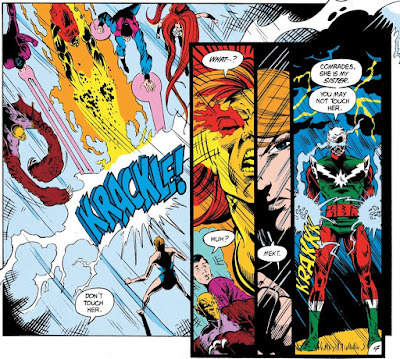 Now free, Element Lad and the other captive Legionnaires decide to strike first at the power spheres, while Karate Kid decides to take on Nemesis Kid alone. On the ground, Karate Kid is losing badly to Nemesis Kid. 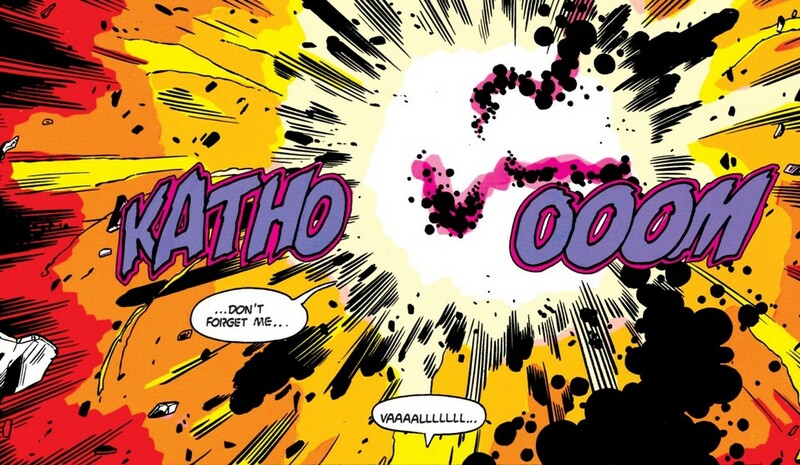 In the air, the rest of the Legionnaires aren’t faring much better, failing to destroy the power spheres. Projectra intervenes to try and save her husband, but her illusions aren’t of much help here. Nemesis Kid begins brutally beating her, spurring Karate Kid back to his feet, to save his wife. Karate Kid is still no match for his more powerful opponent, but he does successfully get his flight ring back from the villain. Projectra pleads with him to flee, to save himself. Karate Kid refuses, believing that it’s too late for him, but not for Orando. Karate Kid flies straight into the power spheres, sacrificing himself to stop the Legion of Super-Villains. 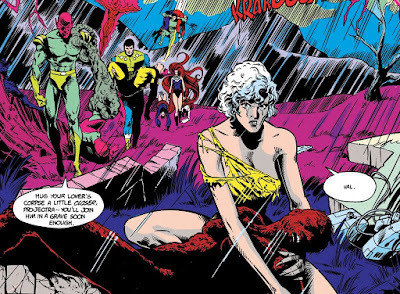 Projectra cradles the charred remains of her husband as the Legion of Super-Villains slowly surround her. The only remaining conscious Legionnaire on site is Lightning Lass. Frightened but determined to save her friends, she lands and prepares to face them all alone. Before they can attack her, they are stopped by Lightning Lord. Back in former Orando space, the science police request that the Legion return to Earth immediately. 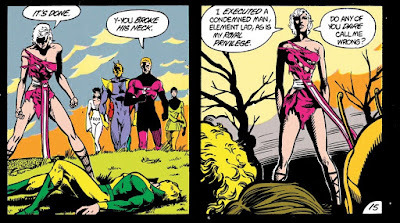 As deputy leader, Dream Girl orders them to go, leaving behind Brainiac 5, Mon-El, Shadow Lass, and Sun Boy. Spurred by a new resolve and fueled by grief and anger, the Legion of Super-Heroes quickly turn the tide against the Legion of Super-Villains. A furious Projectra hunts down Nemesis Kid. Nemesis Kid initially shrugs off her illusions, but is stunned when he looks into her eyes. She grabs him by the neck. “I need no power to destroy you – save the strength born in my blood,” and then she snaps his neck. 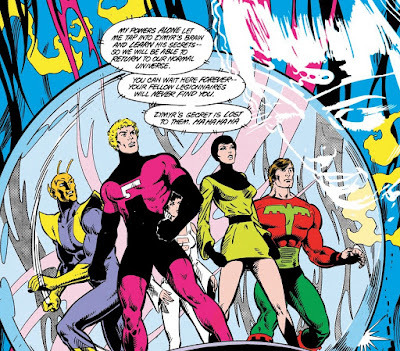 Brainy, Mon-El, Shady, and Ultra Boy are there in former Orando space to meet and defeat the villains attempting to flee. 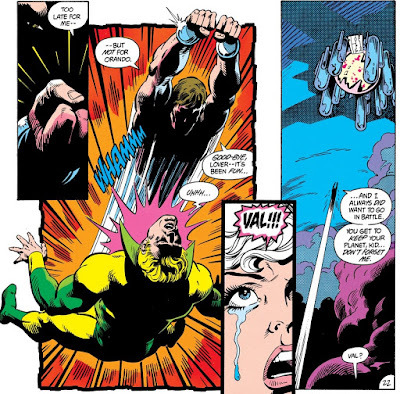 But Brainy is not able to reverse Orando’s fate. Back on Orando, Projectra vows to never leave Orando again after this tragedy. They will secede from the United Planets, and finish their journey into another dimension. 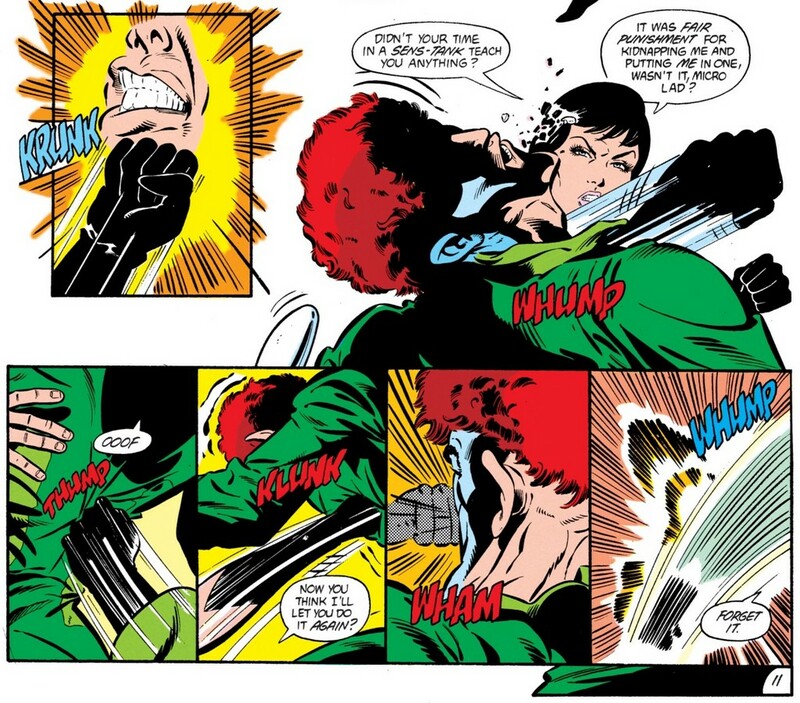 Her former Legion teammates are free to leave with their captive villains in tow, but never to return. As they travel back to the correct dimension, the Legionnaires are ambushed by Esper Lass and left stranded and drifting in unspace. That’s where we end it for now, my fellow Legionnaires. The Baxter series pushed the series to another level, a natural evolution from the recent success of The Great Darkness Saga. A longtime character was killed, another banished to a different dimension. Necks were snapped, and breasts were fed. In the ‘80s, writers like Levitz and Roger Stern were finally starting to realize that villains wouldn’t play fair, and implement that ideology into the stories. Banding together a large cast of opponents gave the story a real sense of uncertainty, and established high stakes for the heroes to overcome. They did not emerge unscathed. 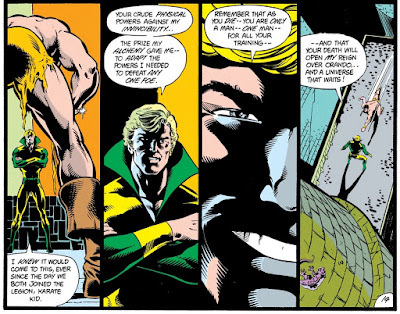 This was the kind of “realism” that was making comics interesting at the time. 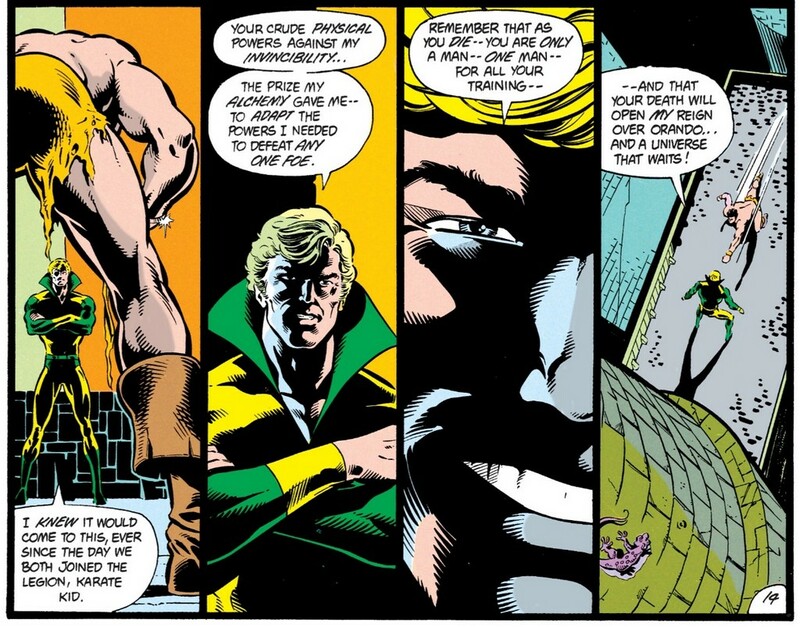 Not the “grim and grittiness” of it, but establishing a legitimate sense of danger for the heroes. 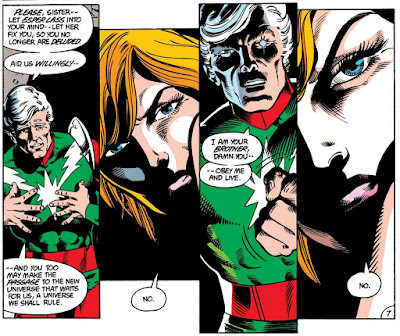 The most important thing for a comic book story, or any story, is the illusion that the hero might actually lose, even if you logically know in your brain that they will not. That’s the whole trick, and the goal. This story achieved that and more.